Retired, grisly Korean War Vet Walt Kowalski yearns to lead a simple life, with his Pabst Blue ribbon beer, old dog Daisy and working on his classic Gran Torino automobile. When gang violence threatens his Korean neighbors, Kowalski is thrown into uncomfortable territory, becoming a mentor for a young Korean boy whose gang initiation was to steal the Gran Torino. Starring an aging Clint Eastwood who also produced and directed the film, Gran Torino explores the relationship one man has with his surroundings - however much he wants nothing to do with them. Gang violence is threatening Kowalskis Michigan neighborhood which has seen much better days. Eastwood shows a softer side to his crotchety exterior. Eastwood certainly kept busy on the film as he also Produced and Directed it and he gives a vintage performance. The Blu-ray disc contains several special featured including "Manning The Wheel: The Meaning of Manhood As Reflected in American Car Culture", "Gran Torino: More Than A Car" and exclusive to the Blu Ray is "The Eastwood Way" Which explores the filming making process of Eastwood up close and personal. It is also compatible with BD Live where you can interact with other fans who are watching the movie at the same time as you. Rated R for pervasive language and mild gang violence, Gran Torino is not one for the kids. Dealing with very adult themes of loss, depression, racism, and the decline of morality in society, the film is thought provoking and masterfully crafted by Eastwood. Fans of Eastwoods style will feel right at home with Gran Torino and will be rooting for the lost soul of Walt Kowalski by the end. 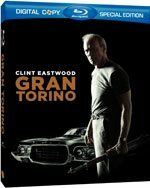 Download Gran Torino from the iTunes Store in Digial HD. For more information about Gran Torino visit the FlickDirect Movie Database.